Global vehicle sales continued to grow during the first half of this year. 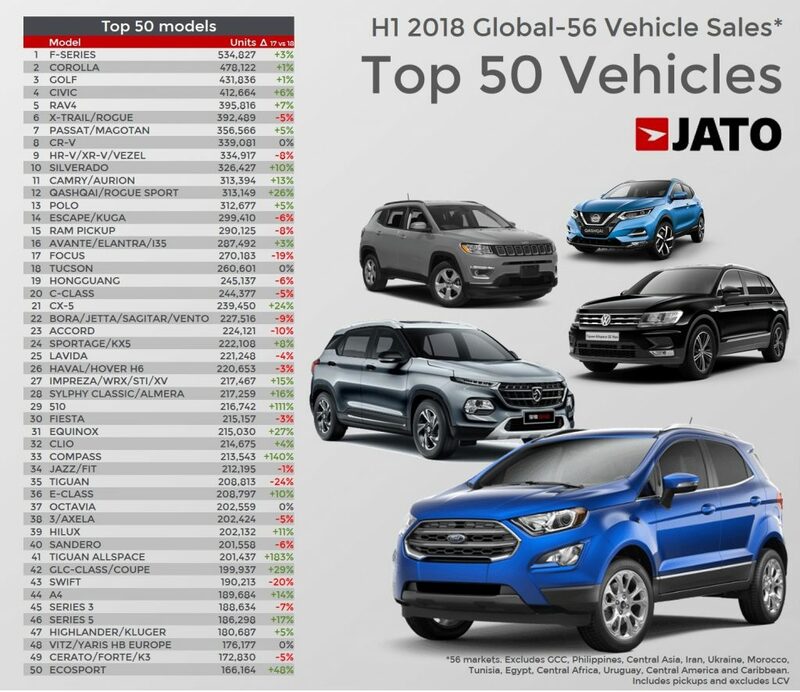 The data collected by JATO for 57 markets around the world indicates that sales totalled 44 million units, up by 3.6% compared to the same period of last year. The positive results coincided with a global economy threatened by the uncertainty of a potential trade war between its largest economies. 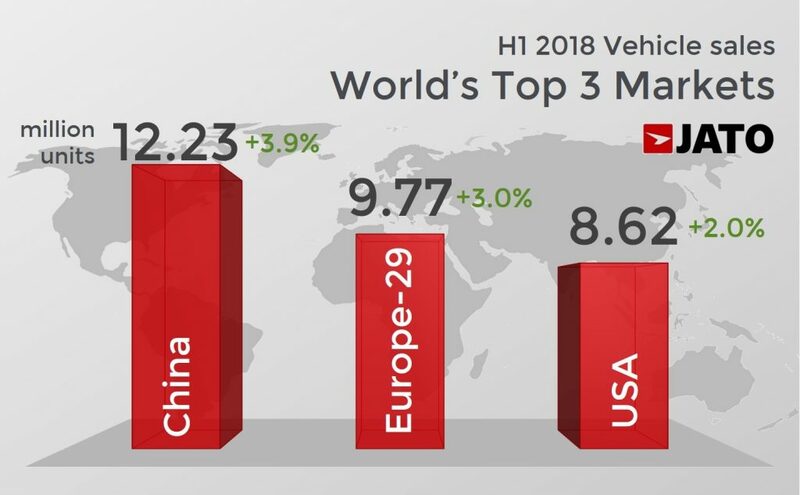 However, the good economic mood in the USA along with improved indicators in Europe, and the continuous expansion of the Chinese economy, are three key factors that have boosted the vehicle market. Despite the importance of these three markets, there is one overarching winner in this story. 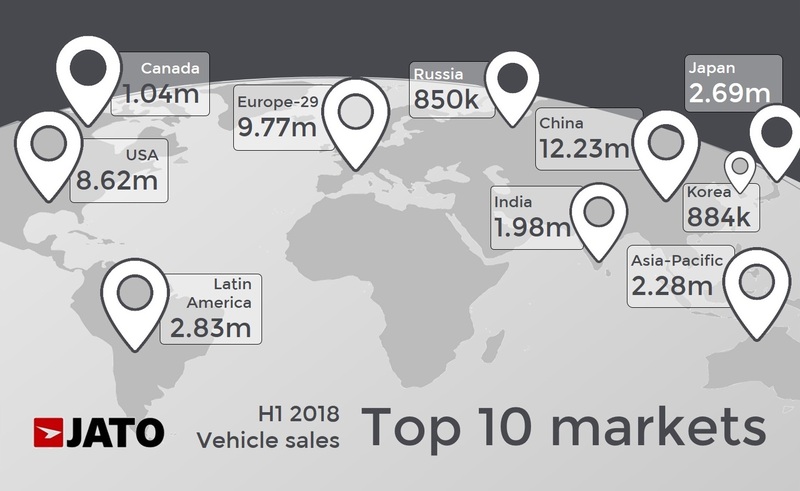 India has finally emerged as a key market for the auto industry as its sales growth was confirmed during the first six months of 2018. The data shows that 29 states and 4 union territories registered increases, with double digit growth in 27 states. 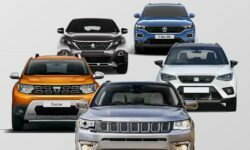 India outsold Germany and became the world’s 4th largest vehicle market behind China, USA and Japan. According to our partner LMC Automotive, Indian vehicle sales are expected to outsell Japan in 2021. China maintained its position as global leader with 12.23 million units (the figures exclude some LCV) and positive growth at +3.9%. 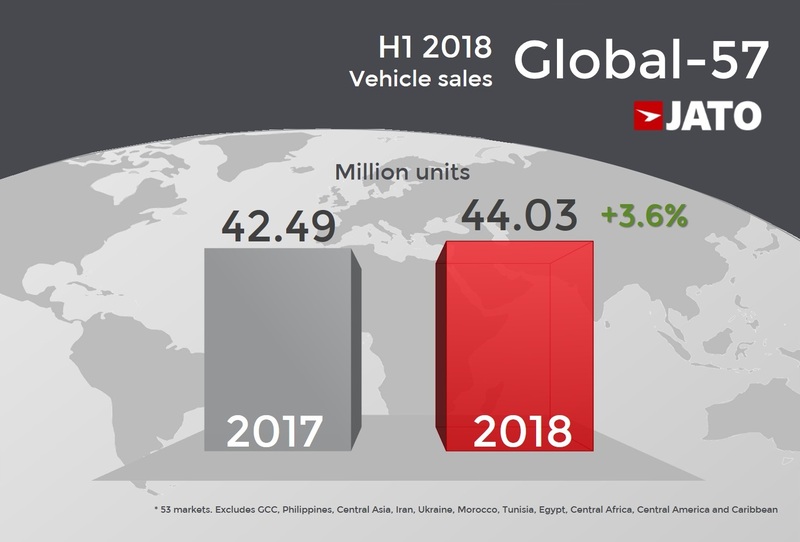 However, the largest vehicle market in the world posted the second lowest sales growth for H1 since 2009. 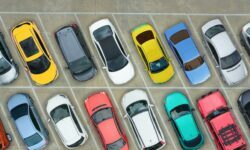 The latest figures for June show that vehicle sales remained stable as the gains posted by sedans (+8%) were offset by lower sales of SUVs and MPVs (-7%). China is facing tougher times due to the uncertainty over the trade war with the USA, as well as the government’s tightened controls on bank lending to curb surging debt. However, SUVs counted for 42% of total car sales. Growth in the USA has been more moderate, despite the economy performing above expectations. The strong economy combined with low unemployment and tax cuts boosted the car market, which posted the second highest first half of its history this year. 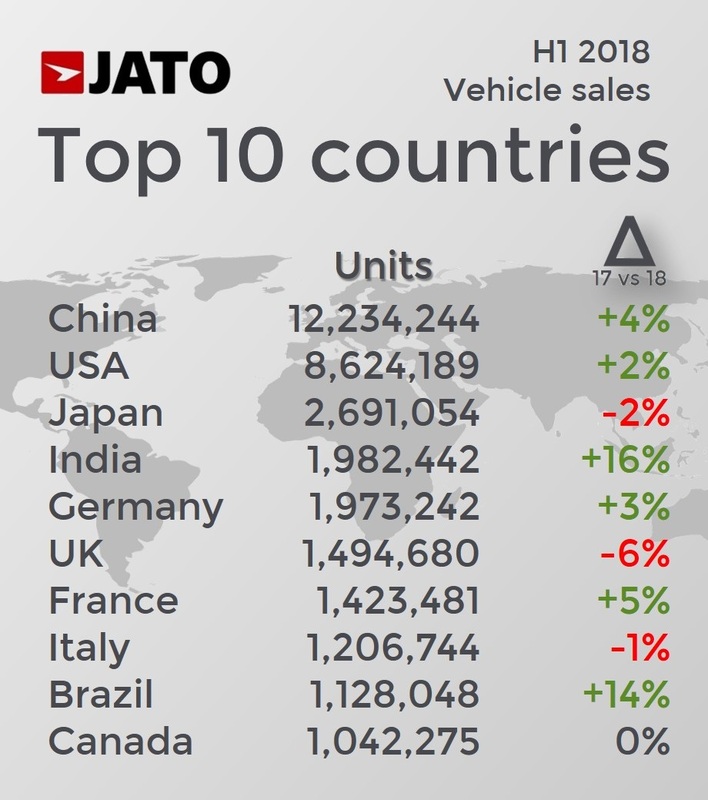 The volume was boosted by more SUVs (+13%) and trucks (+6%), which counted for 60% of total sales, in contrast to the decline posted by cars, down by 10% counting for 33% of total. 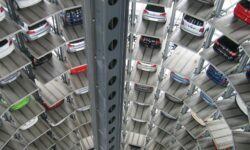 Europe-29 was once again the world’s second largest market with 9.77 million cars and LCVs. The good economic mood among consumers in most of the markets, and a bigger range of choices led to an increase in registrations by 3% and resulted in the highest first half result of the last ten years. 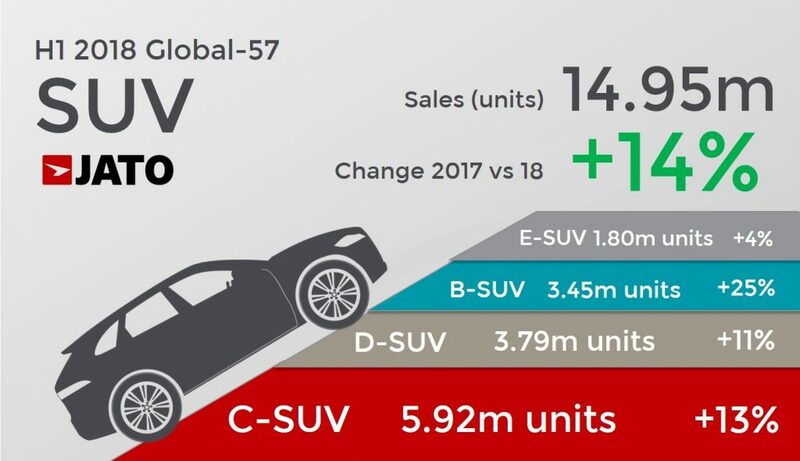 Following the trend in the USA and China, the whole economic bloc continues to be fuelled by more SUVs (+24%) and fewer cars (-4%), counting for 30% and 50% of total cars and LCV sales respectively. Other key markets include Japan, which is still the world’s third largest car market despite the 2% decline in H1. The popular kei-cars couldn’t offset the big declines posted by other segments, which counted for two thirds of the market. Japan is one of the few remaining markets where SUVs don’t play a key role. Latin America also had a positive half thanks to the outstanding performance of Brazilian car sales and improvements in Chile and Ecuador. The Latin American car market is now bigger than the Japanese. Growth was also seen in the Asia-Pacific region, where JATO has data for 8 markets. Vehicle sales totalled 2.28 million units, up by 5%. Most of the growth was explained by the 11% increase recorded by SUVs, the top-selling segment in the region. Canada, Korea and Russia are the other 3 big markets in the top 10, with only the latter showing positive results. 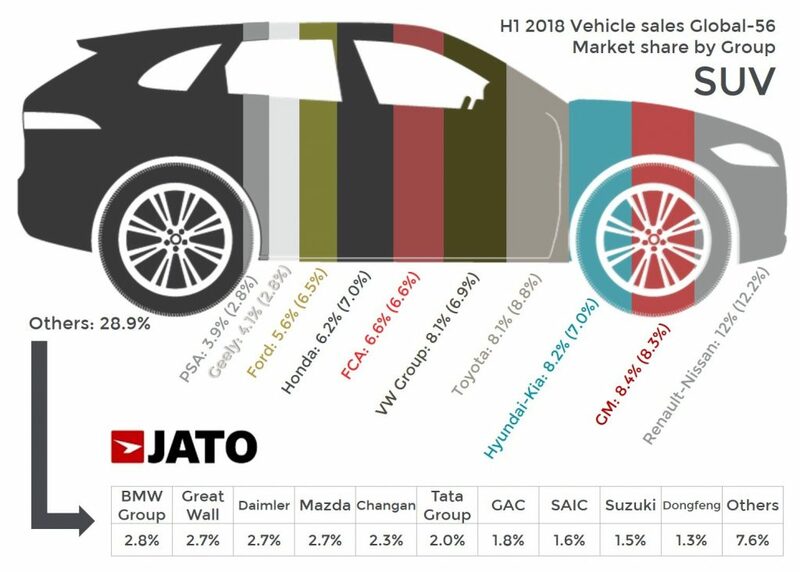 JATO’s information on 57 markets shows that Volkswagen Group was the top-seller with 5.45 million units, growing faster than its two closest competitors. In fact, the Germans grew by almost 7% in H1, compared to the 4% posted by Renault-Nissan in second place and 2% registered by Toyota. 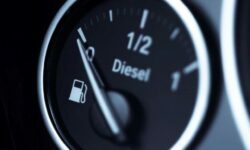 However, the analysis excludes key markets for Renault-Nissan and Toyota, like Iran, some African markets, the Philippines and the Gulf Cooperation Council. However, in the 57 markets covered by JATO, the gap between VW Group and Renault-Nissan was 535,000 units. 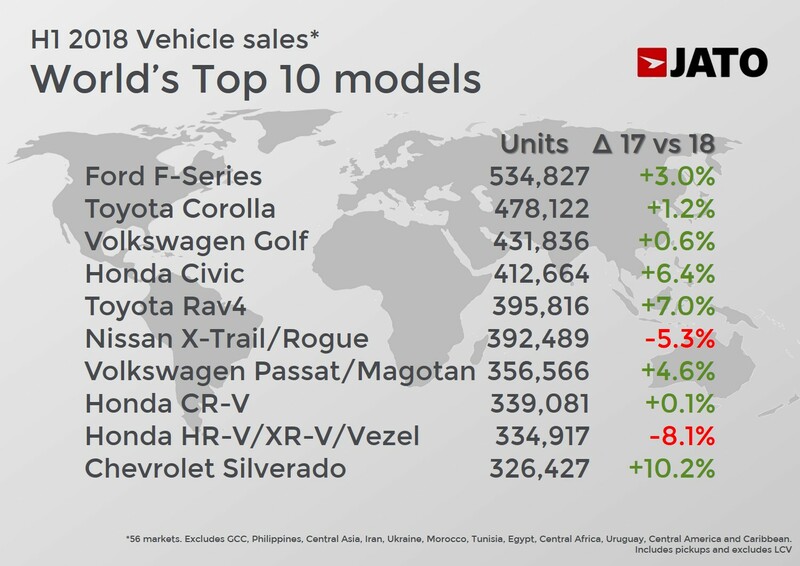 The strong results for VW Group were followed by strong performances from Hyundai-Kia (+8%) and Suzuki, which was able to post a double-digit growth and confirmed its place in the top 10 biggest car makers in the world. Outside the top 10, Geely registered an impressive 35% increase, exceeding the 1 million mark for the first time at 1.09 million units. It was also a good first half for Tata Group, which sold 517,000 units, up by 18%. The Chinese car makers controlled almost 11% of total sales in the 57 markets. The biggest news from the first half of the year was the increase in the dominant position of SUVs, which now count for almost 36% of passenger cars sales. Almost 15 million SUVs were sold in the first six months of 2018, up by a solid 14%, a record for this vehicle type. Volume grew in 10 of the 11 key regions, with double-digit growth in 8, and a drop of 4% in Japan. 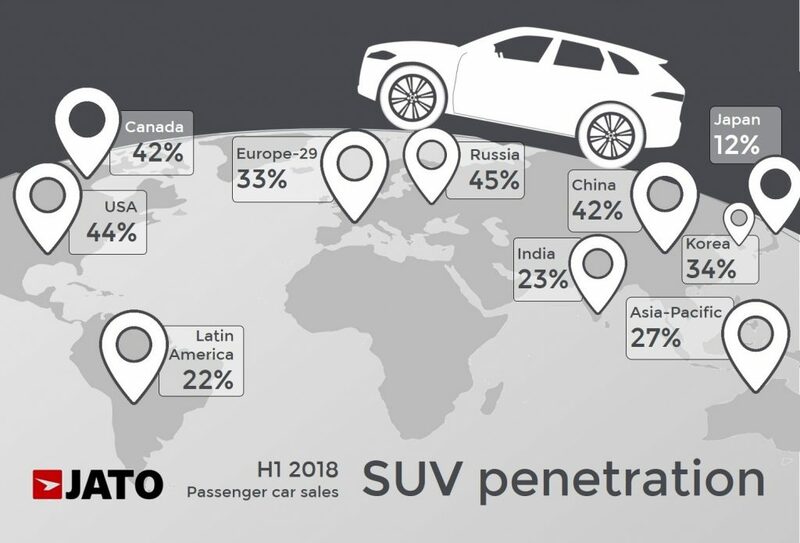 SUVs are very popular in the USA, China, Canada and Russia, but are still lagging behind other segments in Latin America, Japan and India. 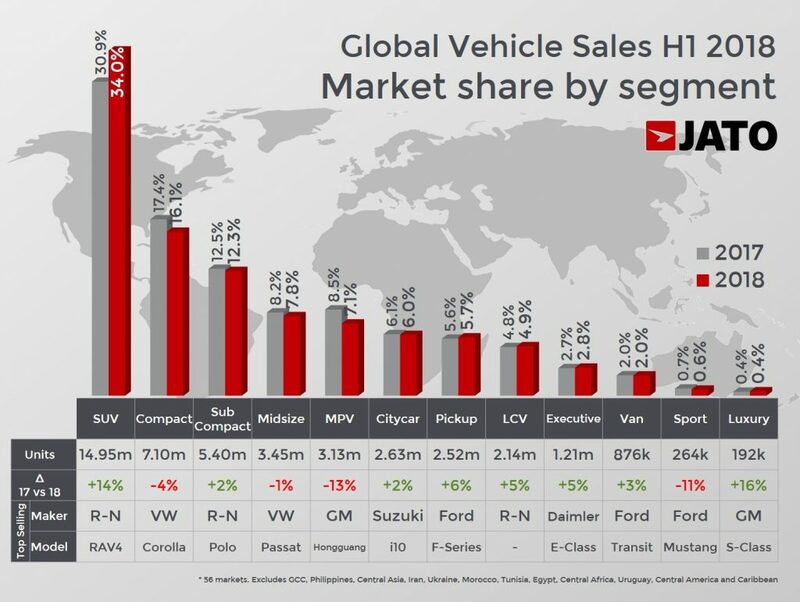 This is good news however, as it shows that SUVs still have growth potential in those key markets. Compact cars followed SUVs in the segments ranking, but their volume fell by 4% to 7.1 million units. The timid growth posted in China (+0.4%) wasn’t enough to offset the declines coming from Europe (-5%) and USA (-8%). China is still their biggest market in both volume and market share. The subcompacts remained the most popular cars in Latin America and India, but their volume increased by only 2% to 5.4 million units. Meanwhile, MPVs continued to lose ground as their sales volume fell by 13% to 3.13 million units. Their demand shrank in China (-19%) and Europe (-23%), their biggest markets. The MPVs are still popular in Japan and Asia-Pacific, with a double-digit market share. In contrast, they are a rarity in Russia and Latin America. The model ranking shows some changes. While the podium is unchanged with the Ford F-Series, Toyota Corolla (excludes the hatchback version called Auris in some markets) and Volkswagen Golf, the Honda Civic and Toyota RAV4 posted big increases and occupied the 4th and 5th positions. This means that the Nissan X-Trail/Rogue lost its place as the world’s best-selling SUV, with this position now occupied by the compact SUV from Toyota. However, the gap between the two SUVs is very small (less than 4,000 units). While the RAV4 is already having a model changeover, the Nissan has been in the market since 2013. The Focus is out the top 10, allowing the Chevrolet Silverado (all versions) to appear in the list in H1 2018. Among the big improvers were the Nissan Qashqai (aka Rogue Sport in USA) boosted by its arrival to USA and Canada. Its rival the Mazda CX-5 also posted a big increase thanks to double-digit growth in 7 of the 9 regions where it is available. The Baojun 510, the small SUV produced by GM in China, more than doubled its sales and was the world’s 29th best-selling passenger car. The Jeep Compass has also performed well, with the new generation proving popular in the USA (+240%), Europe (40,800 units), Latin America (+40%) and India (11,100 units). The Compass was FCA second best-selling product and the world’s 33rd best-selling passenger car. 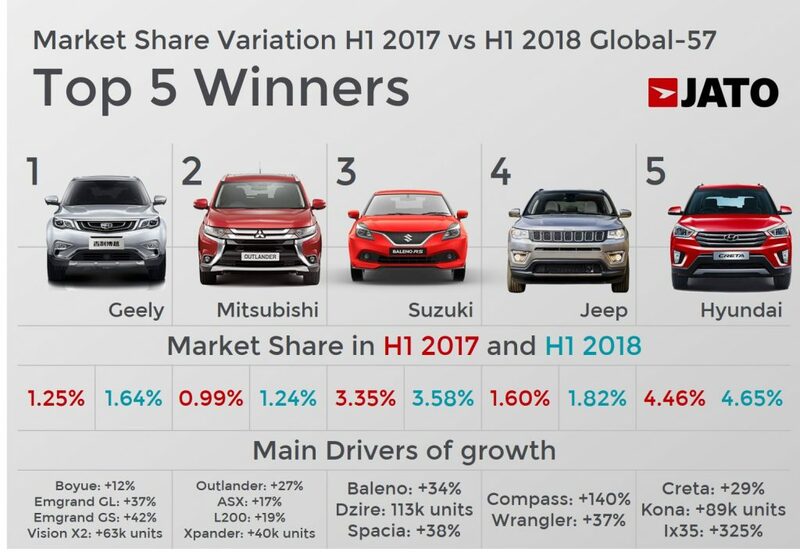 Special mention must be given to the Volkswagen Tiguan Allspace with 201,400 units, the Ford Ecosport (+48%), Jeep Wrangler (+37%), Peugeot 3008 SUV (+42%), Chevrolet Cavalier (+67%), the 113,000 units sold of the Suzuki Dzire, and the 91,200 units sold of the Changan CS55. Hyundai sold 88,500 units of the Kona, BYD sold 81,100 of the Song Max, Volkswagen sold 72,100 units of the T-Roc, and Geely sold 63,200 units of the Vision X3.